This tutorial covers the procedures of simulating Single-Event Upset (SEU) effect in an SRAM chip. 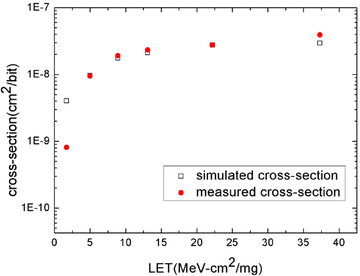 SEU cross-sections under ion beams of various ion are obtained from the simulations. 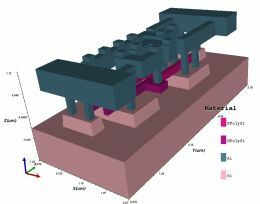 Excellent match with experimental data shows that Cogenda Gds2Mesh/Gseat/Genius tools based TCAD modeling can predict real-world semiconductor device SEU effect, and thus delivers simple but powerful solution for research of semiconductor device radiation effect and radiation hardening approach. 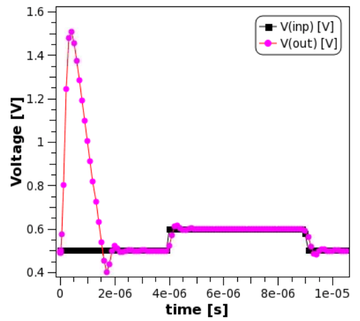 This tutorial describes a TCAD/SPICE mixed-mode simulation approach for studying Single-Event Transients (SET) in an Op-Amp chip (LM124). This BJT chip is too large to fit into TCAD as a whole, so only the device (or device pair) hit by the particle is simulated in TCAD, while all other components are handled in SPICE circuit simulator. This mixed-mode approach enabled us to study SET in larger, more complex analog circuits, without compromising on physical details. In this tutorial, the physics predure of TID effects and the model equations that will be implemented in Genius is outlined first. Following that, the radiation effects on leakage current, threshold and subthreshold slope of nMOSFET devices are illustrated with TCAD simulations using this physics-based model. 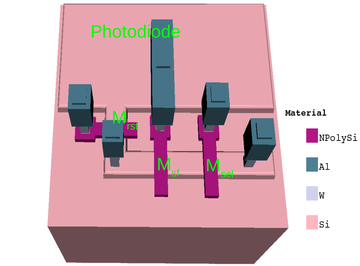 Some process, device and circuit factors that may affect TID effect in MOSFET are described in subsequent sections. This tutorial demonstrate the modeling of a complete CMOS image sensor cell with 3D TCAD simulation. Ray-tracing optics is coupled with TCAD to study the transient response of the sensor cell. 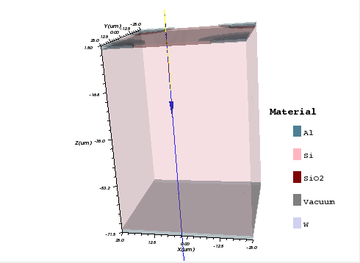 This tutorial is a quick-start guide for simulating Si strip and pixel radiation detector in 2D and 3D, using VisualTCAD and VisualParticle. The behavior of energetic particle is simulated by Monte Carlo simulation, and the behavior of charge carrier is simulated by TCAD simulation. The details of the detector's transient response can be given. This tutorial illustrates a simulation of ESD discharge characteristics of a ggNMOS device in Genius. 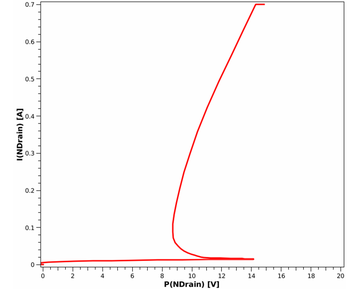 GgNMOS device is commonly used in ICs as ESD protection device. 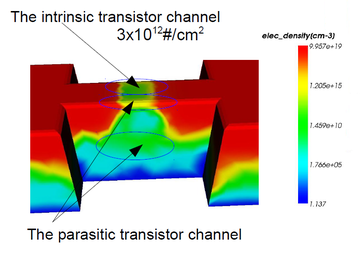 It relies on the turn-on of a parasitic BJT transistor to bypass the large ESD current, and the joule heating in device is a primary reason of its failure. This tutorial covers the physics model needed to model the parasitic device, the impact-ionization effect and thermal effect in ggNMOS. The simulations under the transmission-line pulse (TLP) and human-body mode (HBM) waveforms were demonstrated. This tutorial describes a simulation of a FinFET devices, and the use of the density gradient model to describe the quantum confinement of inversion carriers. In advanced nano scale MOS process technologies, quantum effect becomes more and more important and non-negligible. 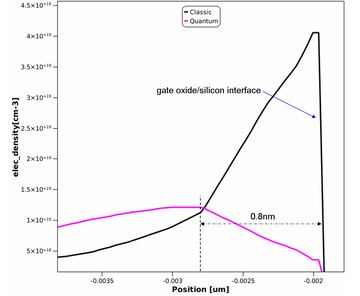 The density-gradient model is a powerful tool for quantum effect simulationcan in TCAD simulators, and has been demonstrated to be suitable in the simulation of deca-nanometer multi-gate transistors. Want to simulate small logic circuit cells in 3D? Genius allows you to simulate a complete cell in a single TCAD model. Or if you want to simulate it the traditional way, you can still perform a mixed-mode circuit and device simulation using SPICE.